Variety: How was it for you to get back into “24” mode as an actor. Kiefer Sutherland: Probably for me it was the easiest out of anyone involved in the process of making the show — which has now become an international process. I think it’s hardest for (exec producers) Howard (Gordon), Manny (Coto) and Evan (Katz), and the rest of the writers. This (revival) was something Howard did on his own. It was something he’s been toying with in his head for quite some time. When he felt he really had something he wanted to do, that’s when he called me. Were you nervous at all about being able to live up to the show’s legacy? Sutherland: For me the character is something I did for eight seasons over a period of almost 10 years. It’s something that I feel so familiar with that it was not difficult for me at all. I rely very heavily on (director) Jon Cassar. If anything I’m doing seems out of the ordinary, he will tell me. It’s not that I wasn’t nervous about it after looking back on everything we did. But the character is something innate in me just because of the amount of time I played him. Have you felt typecast in action roles because you are now synonymous with Jack Bauer? Sutherland: No, I’ve been allowed to do other work, that’s not been a problem. I am proud of what we did (on ‘24’). It’s not something I tried to escape. I take it as a compliment that people think of me as Jack Bauer. But have you ever felt a little haunted by him? Sutherland: I think for some actors, they would have a hard time with it. I still have people come up to me and call me Jack. I find it amusing. I know that would bother some other people, but it doesn’t bother me. ‘24’ is such a big part of my life. When I started on it my daughter was 12. When I finally finished, she had graduated from university. It’s been a huge part of my life and my family’s life. It’s something I feel really positively about. So when you got the call to do “Live Another Day,” you didn’t hesitate? Sutherland: I was quite thrilled to have the opportunity to do it again. We’ve had a long break and we all had renewed energy to do it. What was it like filming in London? Sutherland: Fantastic. Everything is so unique and it’s new for all of us to be there. It’s also new for all of the characters. My character finds himself more comfortable in the situation and the resources he finds in London. It’s been good for the writers to have new context for the show. 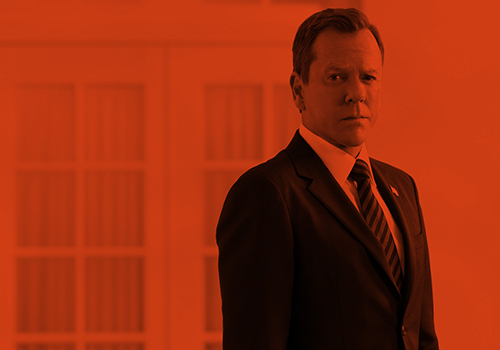 From the start “24” was eerily ahead of its time in its depiction of geopolitical security issues — everything from 9/11 to drones to cyber-threats. It was also a forerunner for the TV biz in being a show that invited binge-viewing. Sutherland: It was a courageous choice by Fox to stick with us and put us out on DVD (after the first season). I don’t think they intended to drive binge-viewing, I think they hoped people would use the DVDs if they’d missed an episode. I don’t think they imagined that the (DVDs) would do the numbers that they did, or that people would take two or three solid days to watch the season. … I did it with ‘Game of Thrones’ when I worked with Kit Harington on ‘Pompeii.’ I had a lot of downtime for a few days and I watched them all — I enjoyed it immensely. What’s it like doing the show in 12 hours this time around instead of 24? It’s more of a cable schedule. Did that change affect your performance? Sutherland: We were so trained in the past that we wouldn’t even start counting where we were until after episode 13 or 14. Now, when we finished episodes seven and eight, (Cassar) looked at me and said ‘Oh my god, we’re almost done.’ Somehow it’s been easier to focus when we could really see the light at the end of the tunnel from the get-go. We were really acutely aware of everything that was happening from scene to scene. … It also made us try to figure out how on earth we did eight full seasons of 24 episodes. Everything else I’m watching are shows that make 10-13 episodes a year. I remember when friends of mine on other shows would talk about their schedule, I would say ‘You’re not allowed to talk to me about that.’ It has made me have even more profound respect for Howard and the writers who just did such a prolific amount of work and did such an amazing job with it. How has it been to reunite with your longtime costars such as Mary Lynn Rajskub and Kim Raver? Sutherland: It’s fantastic and it’s emotional because we’re friends. We’ve all remained friends. There’s a real excitement because I have great faith in those actors, great trust and a sense of understanding of what they’re going to do with certain things. There’s a familiarity that allows us to move quicker with ideas and situations. For all those reasons it’s really exciting. Would you be game to do “24” again in this limited-series format? Sutherland: There’s so many factors. Right now we’re specifically focused on trying to make these 12 episodes live up to the audience’s expectations. That’s what I’m really focused on. I’ve had a wonderful time doing this, but I’m not in a place to answer that question. This entry was posted by Eric on Monday, May 5th, 2014 at 3:05 pm. It is filed under 24: Live Another Day, Interviews. You can follow any responses to this entry through the Comments Feed.